It’s homecoming week for Clarke Community Schools and everyone is invited to cheer on the Indians this Friday as they face Saydel on the new home field. Check out some of the latest images of the new turf and where the Homecoming Game will be held this week. Here’s a quick video of the entire Clarke facility and the new field from the air! 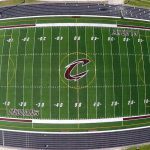 Over the summer, Clarke Schools invested in a brand new synthetic turf football field. Conversation about making this change started a few years ago and the school was finally able to make it happen this year. By using funds saved up over the years in the district’s SAVE and SILO programs, Clarke was able to finance every stage of the installation without borrowing and with a cushion to continue to make improvements to the facilities. Before the synthetic turf was installed, the field needed hundreds of dollars each season just for maintenance and paint and the football and soccer teams were at the mercy of ground conditions. Even the marching band had to practice on the baseball diamond to avoid damaging a wet field. The new field allows unlimited football, soccer and band practices, games and performances without damaging the field. If you have any questions, feel free to contact Steve Seid, Clarke Community Schools Superintendent, by email at sseid@clarke.k12.ia.us or by phone at 641-342-4969 ext. 6.